Ethernet is 40 today: on 22 May 1973, Xerox PARC's Robert Metcalfe documented a new way to communicate, which he dubbed Ethernet. The birthday is rather arbitrary - Metcalfe later admitted that he needed to pick a birthday for marketing reasons, and the memo's publication date was as good as anything else - but there's plenty of reason to celebrate it anyway. What started off as a way to connect a few computers to a printer became a way to connect the entire planet. Ethernet got its name from "luminiferous ether", which 19th century scientists believed was an invisible medium that transmitted electromagnetic waves. Metcalfe's system used a cable rather than a magical invisible cloud, but it was no less magical: it would form what Metcalfe would later describe as "plumbing for the Internet, which is in turn plumbing for the World Wide Web, which is plumbing for Google." It would be a few more years before Ethernet networking was actually deployed - PARC rolled it out in 1976, it was made commercially available in 1980 and became an official IEEE standard in 1985 - but it's been in constant evolution: even 10Mbps seemed impossibly fast in 1976, when 2.96Mbps seemed pretty speedy, but today 100 gigabit Ethernet exists and terabit Ethernet is on the horizon. What made - and makes - Ethernet special is that it wasn't designed to handle very simple networks but much more complicated ones. Metcalfe set out to connect more than 100 computers to a printer, and to each other, and to the precursor of today's internet, ARPAnet. The answer? Packets. As Metcalfe told CNet on the eve of Ethernet's 30th birthday, "Ethernet was based on packets. Data was to be delivered in packets, and the Ethernet was to be decentralized so there could be nothing in the middle that could break or be unscalable. It lay within a hierarchy of protocols, so it only had to do what it needed to do, not things that would be handled elsewhere in the protocol stack, which was a relatively new idea at the time. It was so simple, and that's one of its advantages." If packets collided, they'd be retransmitted until they reached their destination. Ethernet has changed somewhat since Metcalfe's original design. Early, thick coaxial cables were superseded by thin co-ax cabling that was joined with BNC and T connectors, and in the 1980s thin coax was in turn superseded by phone-style twisted pair cabling. Those cables got the now-familiar RJ45 connector which, unlike some more modern connection types - *cough* USB! *cough* - don't waste entire days as you try and fail to get your cables the right way round. Ethernet became Fast Ethernet, which in turn became Gigabit Ethernet, which has evolved from single figures to three figures and will no doubt get faster still. 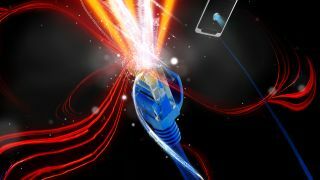 Today, Ethernet remains the dominant networking protocol, but it isn't quite as obvious as it used to be: our laptops are more likely to be connecting over the ether than over Ethernet, and there isn't room for an RJ45 in an HTC One. But the networks our wireless hubs connect to, the backhaul for the cell towers our phones seek out and the data centres that share our statuses, push our photos and stream our songs? There, Ethernet's doing what it's always done: getting the job done.